Well, over a year has passed since I last felt inclined to post an update here, and so here’s another ‘dreckly’ Cornish style catch-up with a few things I can remember that have happened since then. Following Allantide 2015, Britain headed into a winter of wild storms with terrible floods in the North. Here in the far West of Cornwall we were blasted by raging winds and driving rain sweeping in from the Atlantic Ocean, in a barrage that seemed every now and then to show signs of subsiding, only to rise again with greater ferocity. The ground itself was sodden and waterlogged, and as we headed into February, we longed for the Wild Huntsman to rest and for the fair Maid of Spring to reign with a gentler presence. 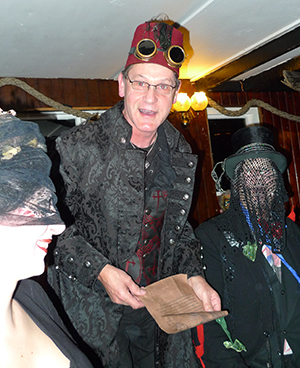 For us, the winter season kicked off in suitably anarchic style with the 2015 Guise Assembly in Penzance on December the 5th. Here, the various Guise Guilds gathered in full costume (you’re quite rightly fined if you turn up dressed for the everyday world) for much mock-ceremonial pompery and highly corrupt voting systems, degenerating into the throwing of small missiles at each other (raw sprouts have become the weapon of choice). The major ceremonial is that of registration – the established guilds re-register to remain a Guise Guild of Penzance for another year, new Guilds register for the first time, and for all it is an opportunity to recruit new members, or pilfer members from other Guilds. 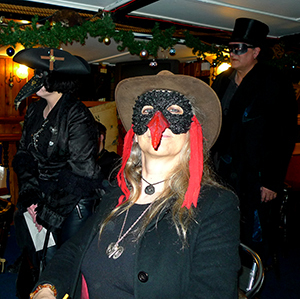 Of course, in West Cornwall, the Guise season culminates in the spectacular midwinter festival of Montol in Penzance. The weather in the lead up had been threatening to be quite terrible, but on the night all was well, with only the occasional light fall of rain which did nothing to deter the revellers and guise performers who filled the ancient streets with music, bizarre masks, bestial forms and mesmerising fire performances. It was a particularly busy Montol for me, as not only was I to perform much of the night with my Guise Guild; ‘The Glorious Company of the Egyptian House’, I also had two performances as Kasek Nos – The Montol mast-beast, or ‘obby oss’. The revellers processed the giant ‘Sun Resplendent’ up to the awaiting unlit bonfire which, due to the very wet weather we had experienced, was in a saturated and muddy expanse. Large crowds however assembled to witness the fire dancers and the sun resplendent bursting into a blazing glory atop the large bonfire. My time then came to climb into the oss and venture out into the large, roped off enclosure with the trusty Teazer, Zoe Young. My vision was severely hampered by the brilliant light of the fire and the many camera flashes transforming my small gauze ‘window’ into a starry mesh of dazzling lights. Vaguely however, I could just make out the guidance of the Teazer and we danced our dance of death and resurrection as a traditional ‘serpent dance’ snaked around us and the fire. Keeping myself from slipping in the mud would have been perilous under ‘normal’ circumstances, but dancing whilst bearing the weight of the oss made the avoidance of accident seem uncanny! The long dance of falling to the earth and rising to stand again under this weight, over and over, took its toll however, and I was truly exhausted. With my limited vision, I tried to locate the performers area so I could make a swift and badly needed exit at the dance’s end. However, when the time came, I went to the ground expecting my fellow Montol performers to lift the rope for me to pass beneath, but this didn’t happen. Without the strength to stand again, I was eventually helped out of the oss and found I had instead collapsed into the crowd, having missed the safety of the performers’ area by quite a distance. Startled children looked in horror as my dishevelled form crawled out from beneath my disguise of mare’s skull and grey tatters. Desperately needed water was guzzled and relief came when I was whisked away by car to our hotel to rest before preparing for the main performance of the Guise Guild. 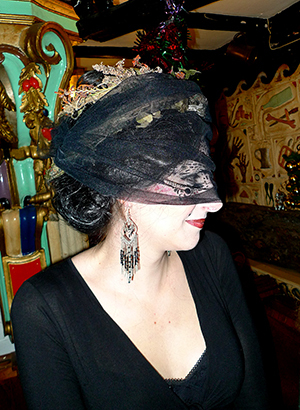 Changing into my serpent skin mask and black floor-length lace veil of black and golden tatters, I made my way out onto the ancient Chapel Street to join my fellows of The Glorious Company of the Egyptian House. This year our discordant procession through the ancient, darkened streets included a magnificent full size Egyptian Sarcophagus and flaming torch bearers; giving the Guild a hauntingly funereal presence as we moved from tavern to tavern. By the end of our processional journey, my body was just one long collection of aches, pains and fatigue, yet now was the time to prepare for the late night appearance of Kasek Nos. In her stable; the Admiral Benbow, my ‘Gyptian skin was changed again for that of the Night Mare oss, and as the door to the Benbow was closed by Trish; the wonderful Landlady of the Inn, barring all entry or exit, The Teazer and Oss waited as the hypnotic beat of the Montol band and masked revellers advanced slowly towards us, growing louder and louder as they progressed down the long and ancient street. Eventually, the band reach the Inn where all gather around its door. The tune stops, giving way to a pensive moment of quiet before the tune for the oss’s dance begins. Three startlingly loud bangs are made upon the thick carved wooden door, summoning the oss. It is thrown open by the Landlady and Kasek Nos and the Teazer step out into the music of the masked players and a rousing cheer from the crowd. Onward, we dance again the dance of death and resurrection, down towards the sea and, close to the town’s Holy Headland, all gather around the last great fire of the night. 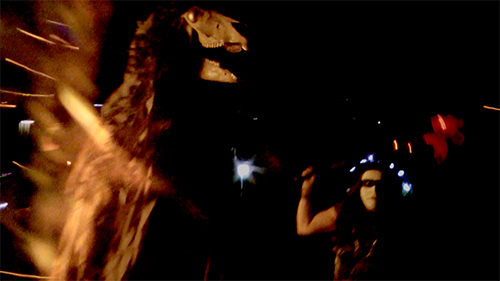 Kasek Nos stalks the crowd for a ‘victim’ and the old ceremony of ‘Chalking the Mock’ is performed, and Kasek Nos retires to the secret stable. 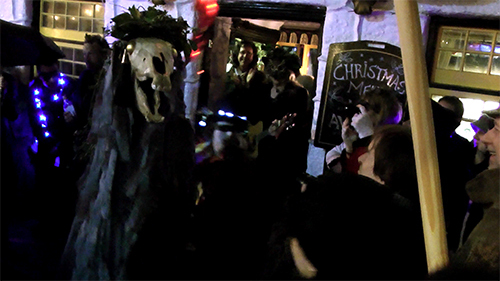 My poor body had just about recovered from my Montol ordeal in time for my facilitating of the Penwith Pagan Moot’s Candlemas ritual. The night before I had gone down at dusk to the stream below the cottage to pull plenty of reeds to make traditional Brigid’s Crosses for the ceremony’s altar. The moot gathered in the village hall of Sancreed in West Cornwall. This small and beautiful village is home to the deeply numinous Sancreed HolyWell, and has become the traditional home of the moot’s Candlemas rites. On this occasion, I wanted to create a ceremony that focussed on the transformative mystery and blessings of the divine feminine at this time, and so as all entered the hall they were greeted by a simple central altar, draped in black, with the Goddess figure veiled also in black and surrounded only by the symbols of the elements; the lantern, the stone, the cup of water and the censer of incense. The broom, and an empty bowl were at the altar’s base. Hers is the mystery of transformation; from the Dark Mother of the Child of Light, to the White Maid of Spring. Hers is a rite of gentle fires, not only for the returning light, but because of the theme of purification. As the Goddess renews herself, and the serpent sheds its skin in rebirth, so too do we purify ourselves and our homes in preparation for the waxing year. Following the opening rites of the Circle, the moot’s traditional procession to the holy well was made where all partook in a blessing of purification, and contemplated the mysteries of the Goddess, the mystery of transformation and the return of life and light to the land. Fair One, return to us and let unfold your mystery. Arise from the dark mists of the hidden realms, from the ashes of winter to awaken the land from its slumber. Let your gentle lights shine forth to illumine the path of the waxing year and bring to us inspiration. Maiden fair, goddess of the waxing light, let stir the sleeping serpent of the earth, and quicken the tide of life. Out of darkness arise the dawn, out of winter arise the spring, out of nothing let all be born, out of emptiness abundance bring. Awake, arise, return and let wax forth light and life unto the land, let us be purified and reborn into the light. Let seed and bud burst forth and flowers and greening adorn the land anew. Let the dark give way unto light, let death give way unto life and what was cold be now warmed by the sacred fires. Out of nothing, all things living, out of emptiness, all light, out of blindness, now our sight. A little water from the well was processed back to the hall where the altar was now found draped in white, with the Goddess figure unveiled and surrounded by white flowers and ivy and flanked by large white candles. The water was sprinkled over the Goddess figure to bless the new altar with Her presence. Hail Fair One, Bride, Brigid, Ia! The ashes of winter are swept, and let altar, forge and hearth be kindled, to welcome her; Goddess of the Spring, she of prophecy, inspiration, poetry, smithcraft and healing. By the fire that quickens all, we welcome her, and let wax forth light and life unto the land. So shall it be. A celebratory mill was trod to a simple drum beat about the central altar, to stir and fan the fires of life. Dance ye as the candles burn. By light and life and love arise! 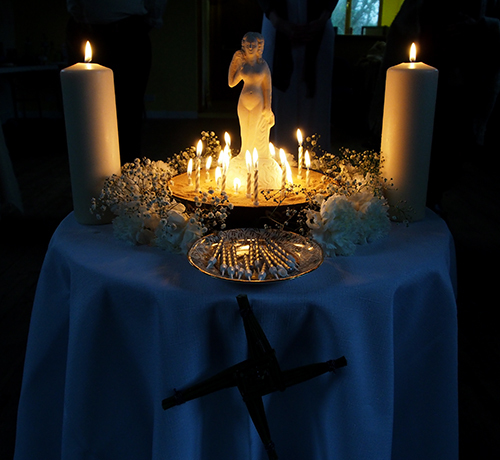 Here began what was perhaps the most moving part of the ritual, where all, in turn, approached the altar to speak of their devotion to the Goddess as they lit a candle in offering, to be placed about the figure’s base, until she was bathed in a radiant light of golden devotion. On the 27th of February, Jane and I were in Ipswich for the launch event for our publication of Nigel Pearson’s wonderful book ‘The Devil’s Plantation – East Anglian Lore, Witchcraft & Folk-Magic’. 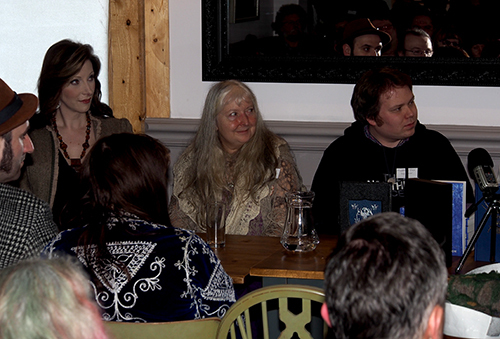 This turned out to be a bit of a gathering of a ‘who’s who’ of East Anglian witchcraft and paganism! 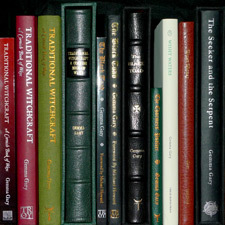 Entertaining and informative talks were given by Matthew Bill on the tradition of ‘The Black Book’, Pete Jennings on Black Dogs, Michael Clarke on The Magical Landscape of East Anglia, and Val Thomas on her work with East Anglian Magic. 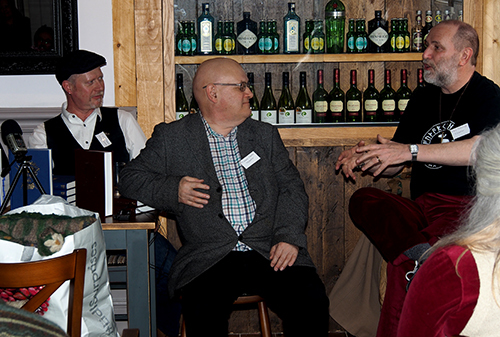 Of course, Nigel was able to speak about his book and gave a reading, and there was a question and answers panel, which I was surprised to have been asked to take part in – being an ‘outsider’ from the opposite end of the country! My family is partly from East Anglia though, so I guess that counts! 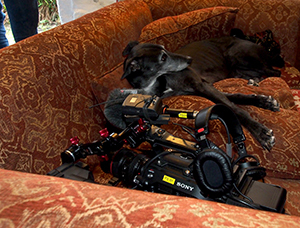 The April full moon brought the novelty of a film crew to the cottage; they were filming a television series exploring mysterious locations around the world, with the presenter immersing herself in various unusual situations and activities. 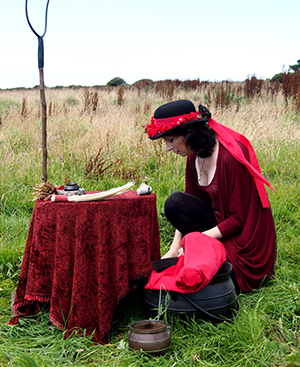 For this episode of the series they visited Cornwall and wanted to explore traditions surrounding contemporary witchcraft, magic, and ancient sites. The crew were all lovely, and it was fascinating to see them at work, although I’m not sure what Inky made of all these strange goings on occurring in his cottage! I was filmed with the presenter by the fire, discussing witchcraft and looking at various forms of magic. Later we travelled out to the lovely pub at the suitably (Cornish) witchy location of Logan Rock for dinner, before venturing out to a cave used by the coven Ros an Bucca. 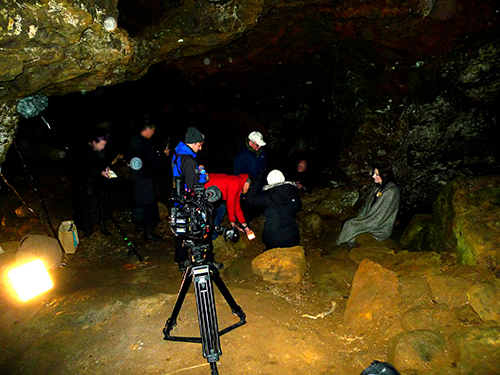 A few members of the coven arrived and we allowed the crew to film a very simple ritual which, with the lights and the smoke from the fire, must have made for some very atmospheric footage. 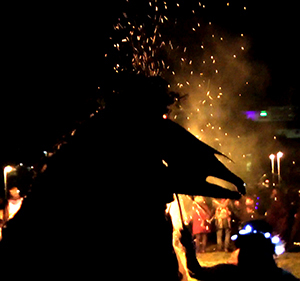 With the 1st of May the Penwith Moot gathered at Carn Bosarvern Farm to celebrate Beltane. I had intended the ritual to be entirely outside, but as it was rather windy and a little wet, the rite was altered to be partly inside the handy and beautiful cob hut. In the centre of our circle we had an altar with the figures of the Goddess and the Horned God, the libation things, symbols of the elements and a crown of flowers, and an antlered crown of greenery. Now at Beltane, we arrive at Samhain’s opposite; and as Samhain honours the mysteries of death, and the opening of winter’s tide, so at Beltane we celebrate life, love, and greet the opening of summer with this festival of fire. At Beltane we kindle the fires of passion, fruitful fertility and the illumination that arises from the mystery of the union of opposites; a mystery we shall partake of by celebrating the marriage of the Goddess and the God. For summer is a-coming in! The Lady and Lord stepped forward into the centre of the circle. I crowned the Lady with chaplet of flowers and said ‘Hail Queen of the May’ which was repeated by all present. I then crowned the Lord with chaplet of greenery and said ‘Hail King of the May!’, again repeated by all. Let us follow our Queen and King in procession to the dancing ground, there to make merry and rejoice in the mystery of union! Purification, protection and fruitful fertility. Behold the mystic marriage of the Goddess and the God, wherein is enshrined the union of all opposites. Contemplate and partake of this mystery, for we and all life are the fruit of such union. Contemplate also the union of opposites within ourselves, for we are each of us a congress of female and male, dark and light, creation and destruction. Know this, know thyself and be whole. Jack-in-the-green, young Lord of the wild-wood, of Oak and Ash and Thorn am I; waxing in strength as the sun towards its zenith. Silvanus, Robin, Faunus am I. By the winds of enchantment, passion, will and force, caressing this fair land, behold the mystery I offer; the fiery seed of promise! Fair Flora am I, ripened Maid of the blossoming land, silver Queen of the tides of life and keeper of the fathomless waters of the earth. Maia, Bona Dea, Marian am I. By the fertile land, by rising springs and sweet falling rains, to my hand and heart, thy loving sacrifice I take. Let sky be unto earth, sun be unto moon, force be unto form! Let all be one in life and love to bear forth the fruitfulness of the year! The Queen and King of the May, still holding hands, then jumped the fire together, and all cheered in celebration. The next moot ceremony, completing my year of rituals written for the Penwith Pagan Moot was Lammas. This again took place at Carn Bosavern Farm. The weather was kind enough to allow an outdoor ceremony with a fire in the centre of our circle, the stang presiding over the altar with the old corn figure upon it. Welcome to this our ritual celebration of Lammas or Lughnasadh. Its name Lammas derives from the Anglo Saxon for ‘loaf mass’, and Lughnasadh, derived from the Gaelic for the month of August, reveals this to be the Feast of Lugh; ancient Lord of the Sun, the harvest, and creative skill. Here in Cornwall we have Guldize; the feast of ricks, or grain stacks. Here the spirit of the harvest is enshrined in the last of the grain crop to be cut. Ours is a ritual of celebration for the harvests of our labours, and thanksgiving for the abundance of the land. It is also a time of mourning, for with the harvest the time of growth is spent, and the year turns towards the tide of death. Our themes then are of sacrifice, but also of rebirth; for in death there is life. The sacrificial death of the spirit of the field in the reaping, threshing and grinding of the corn, leads to resurrection in the ale and bread to sustain us. Also, within the grain is the seed of promise for the return of life and future harvests. Hail spirit of the field, spirit of harvests past and present. Guider of our endeavours and guardian of fertility and the fruits of our labours. We give thanks for all that we have reaped under thy loving presence! Hail the spirit of the field! All is sorrow, the summer is dead, all is spent and the Old Ones turn now to the West. Now begins the reddening of the land and let us prepare, for the dark of the year approaches. Behold the spirit of harvests present and future! Blessed be this potent charm of the Old One’s golden seed; a lantern to guard and guide us through the darkening of the year, a sacred token of the promise of life’s return. May thy reaping be bounteous; a blessing of all fruitfulness upon thy heart, hearth and home! Hail the spirit of the harvest! The spirit of the corn was then touched to ground, held aloft, shown to east, south, and west, but not to the north, for no sun comes from there. It was then Sprinkled with water, so that future harvests may be blessed by nourishing rains before being set upon the altar to preside over the remainder of the rite. Each of us then approached the cauldron to take some corn for ourselves, to keep as a charm for the blessings of the spirit of the harvest upon our homes. There is of course much more I could write about in this catch-up, such as the making of the divination film for the Museum of Witchcraft & Magic, the various Museum events we have attended – one highlight being the taking part in small and impromptu ritual outside the museum with Ralph Harvey to welcome the beautiful ‘Dashwood Chalice’ which he had then donated. 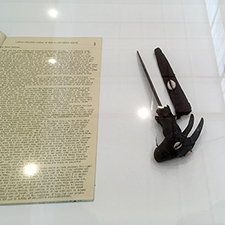 Most of these happenings can be read however on the museum’s own online diary. What an amazing account of magic, beauty and joy! Thank you for sharing!